Polish Flag – Return to Prominence? But are those two goals actually in conflict? Do efforts to improve well-being take a toll on economic growth or, to the contrary, promote it? 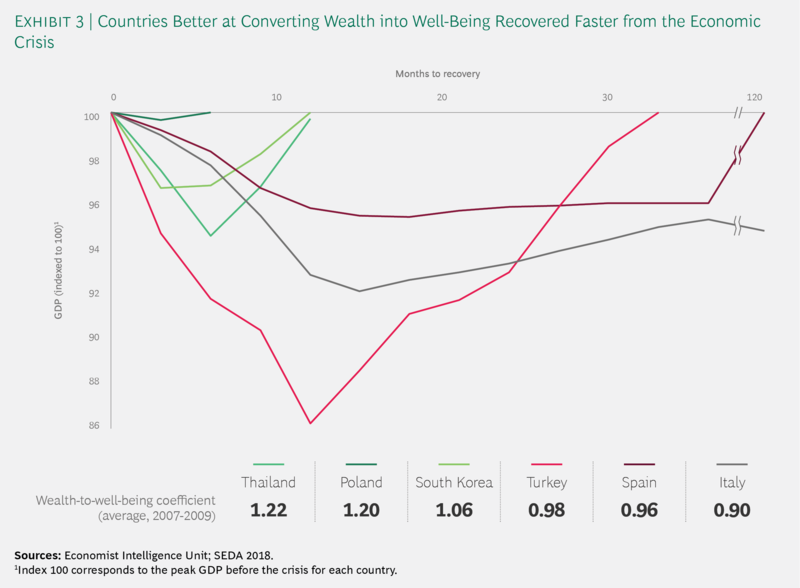 In the 2018 analysis, which included 152 countries and used data from 2007 through 2016, we found that countries that were better at converting wealth into well-being tended to have faster economic growth. They also tended to be more resilient—recovering more quickly from the 2008–2009 financial crisis. Pursuing the twin objectives of growth and well-being should be the aim of long-term development strategies. This doesn’t happen on its own, though—it is the result of thoughtful policy decisions that strike the right balance. This balanced approach is relevant not just under normal circumstances but also during times of crisis. At such times, countries must resist the temptation to prioritize stimulating economic growth or reducing fiscal deficits at the expense of well-being. For countries that already enjoy a relatively high level of well-being, investments in education and employment can do the most to improve both well-being and economic growth. 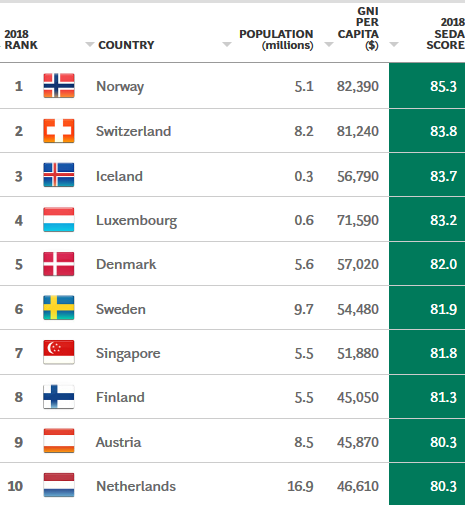 For countries with a relatively low level of well-being, it is not enough to focus only on areas that are key pillars of development, such as health and education. They must also improve governance, a critical foundation for sustainable economic growth, and infrastructure. Within infrastructure, digital connectivity has pervasive effects on all dimensions of well-being. It should be front and center for policymakers—particularly in countries with relatively low levels of connectivity. Countries can—and should—aim to achieve the twin objectives of sustainable economic growth and improved well-being. SEDA can be a valuable tool as governments undertake this journey, shedding light on the impact of past policy decisions and informing strategies for the future. Sustainable development is every country’s goal, and improving the well-being of citizens is central to that pursuit. 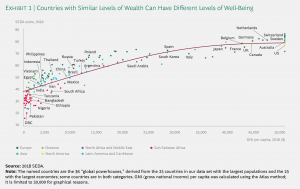 A country’s wealth is a major factor in determining its well-being. However, as the design of SEDA scores reflects, creating well-being requires a multidimensional approach, one that goes beyond efforts to increase wealth. 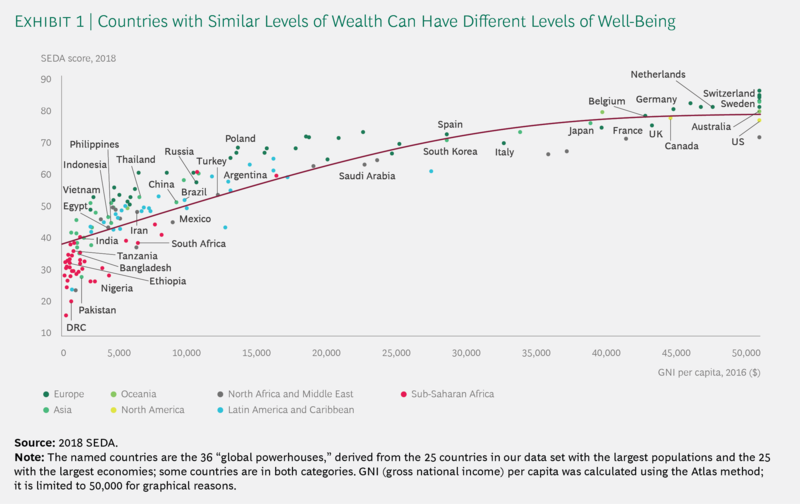 The ability to convert wealth into well-being varies widely among countries, reflecting different societal choices, policy decisions, and capacity to execute them. 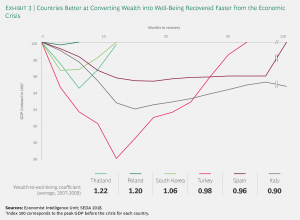 However, as this report makes clear, good performance offers a double reward: countries that outperform their peers in converting wealth into well-being also tend to grow faster. This finding is consistent with recent research showing that inclusive societies tend to grow in a more sustained way over the long term. What should countries do? It depend on their situation. There are no silver bullets or standard blueprints. What we do know, however, is that the lack of progress in specific dimensions can hamper overall gains in well-being. Further, the dimensions with the best potential to boost well-being change with each new stage in a country’s development. Over the past six years, SEDA has been an important tool for governments and international organizations as they review strategic priorities. It has been used to assess a country’s strengths and weaknesses, identify barriers to development, and set priorities and a national strategy for sustainable growth. It has also been a valuable mechanism for tracking the progress and managing the implementation of those strategies. Focusing on the key success factors for converting wealth into well-being is not just a nice-to-have. 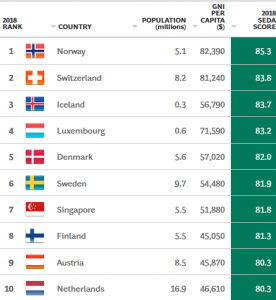 Countries that fail to prioritize them will squander valuable opportunities for sustained progress in economic development—and find themselves gradually left behind by peers. Copyright iM. All Rights Reserved.